Cycling in Brittany France , French guided biking vacation adventure. "Fantastic! As a first cycling holiday it was a great experience and found the support from the guides great. It exceeded my expectations!" -- Jenny, Bowral, NSW, Australia. Pickups are from Redon TGV station. Return to Lorient TGV station. Brittany – a land of legends. Its Celtic roots – populated by settlers from across the English Channel in the 5th Century- and the fierce maintenance of its Breizh or Breton language – have resulted in a region with a character quite different from the rest of France. With a coastline longer than any other French region, the peninsular takes much of its identity from the sea – both the landscape and the cuisine are dominated by the Atlantic that comes crashing in against the Western coast. The area we have chosen for our tour is the Morbihan, which lies in the southern part of Brittany. It takes its name from the Breton Mor-Bihan, or ‘little sea’, the inland sea protected from the wild ocean and scattered with picturesque islands. 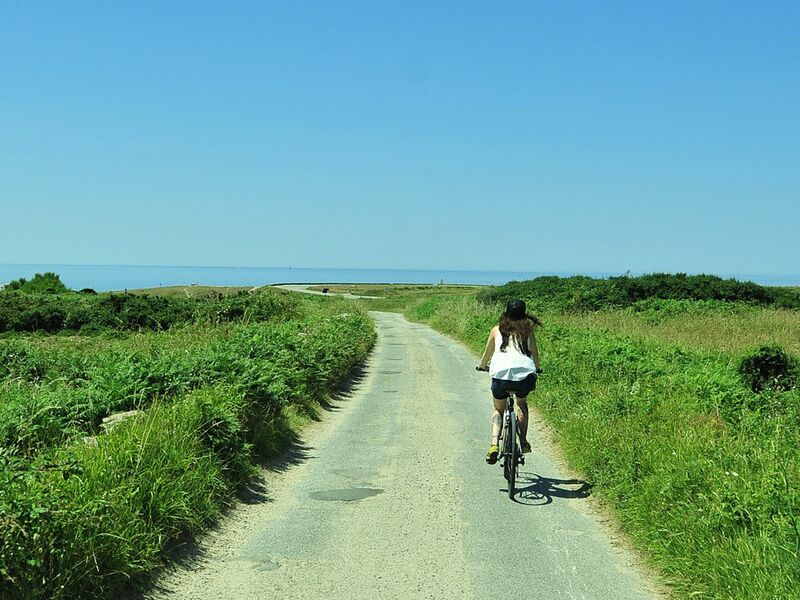 The region is mostly gently rolling, making it ideal for cycling, with the landscape enhanced by the many lakes, rivers and coastal stretches. There is an abundance of history, from the astonishing prehistoric standing-stone alignments at Carnac, through the timber framed houses and majestic medieval cathedral of Vannes, to the battles of the French Revolution on the Quiberon peninsular. Perhaps the most famous example of Breton cuisine is the crêpe, and its savoury cousin the galette. These will make a welcome treat at lunch stops; galettes filled with ham, cheese or even boudin noire avec pommes caremelisés – black pudding and apples; maybe if you are still hungry, a crêpe with banana and chocolate or salt-butter caramel! In the evening, though , we will sample a more refined cuisine, based around the abundance of fish and seafood, and the salt-marsh lamb that grazes on the flats around the coast. For those with a sweet tooth, Far Breton is a delicious speciality combining cream, eggs sugar and rum-soaked prunes, and Kouign amann is a delicious buttery pastry that we will often find in the breakfast buffet! Although it is not principally wine region, Muscadet is grown in the south of the region and complements the seafood beautifully. The region is rightfully proud of its cider however, whether dry or sweet; and don’t miss the opportunity to try chouchen or mead brewed from honey. Brittany has a proud history of cycling, with Tour de France champions Jean Robic, Louison Bobet (3 times) and, most famously, 5 time winner Bernard Hinault hailing from the province; on our Brittany Celtic Legends tour you will follow in their wheeltracks to discover the rich heritage of this distinctive region. We will collect you from Redon TGV station for the 1km transfer back to our spa-hotel by the charming village of La Gacilly. 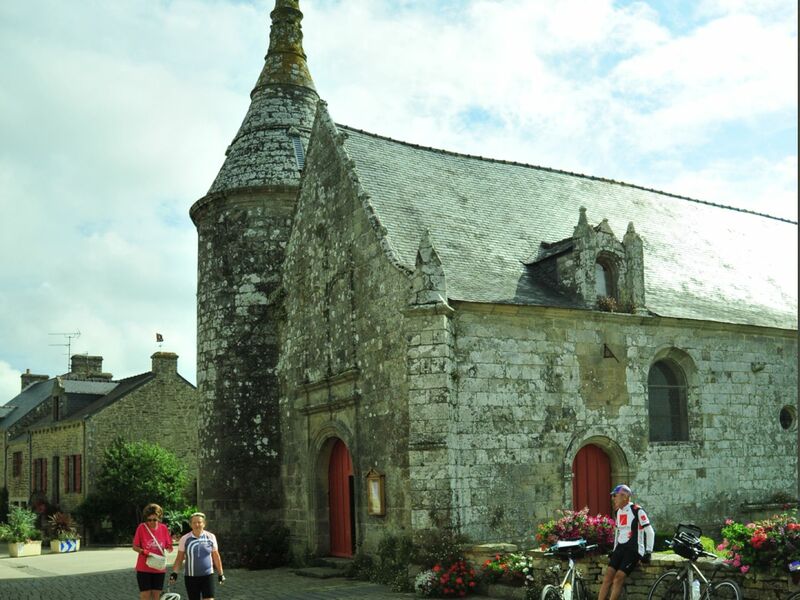 After fitting bikes and making sure everybody is comfortable, we’ll take a short familiarisation ride, which will take us to a Neolithic burial dolmen (from the Breton ‘stone table’) and into the village of La Gacilly which is full of craft shops and artisan workshops. There will be chance for a swim, sauna or massage before the first of many memorable dinners. The first part of the day is spent on the towpath of the Nantes-Brest canal which merges with the River Oust to flow beside dramatic cliffs. We enter the delightful river port town of Redon to find the Monday morning market in full swing. 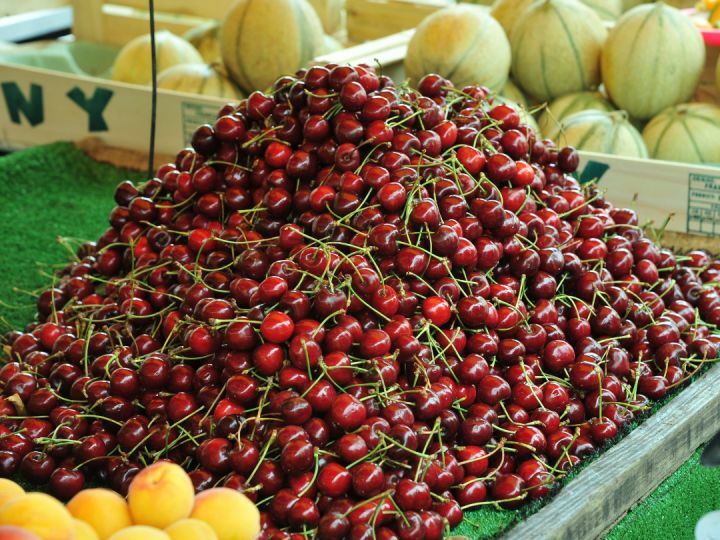 After browsing the weekly market, perhaps a delicious crêpe for lunch to fuel the afternoon’s exertions! We rejoin the canal for a few kilometres before heading west through the rolling farmland where the blé noire or buckwheat is grown, an essential ingredient of the Breton savoury crêpe. We arrive at our hotel in the delightful village of Roche Bernard with a charming old quarter overlooking a harbour full of sailing boats. The hotel has a noted restaurant – we will certainly dine well after our first day’s efforts! We leave Roche Bernard, crossing the river Oust on the magnificent new bridge, maybe stopping for a fabulous vista of the harbour. 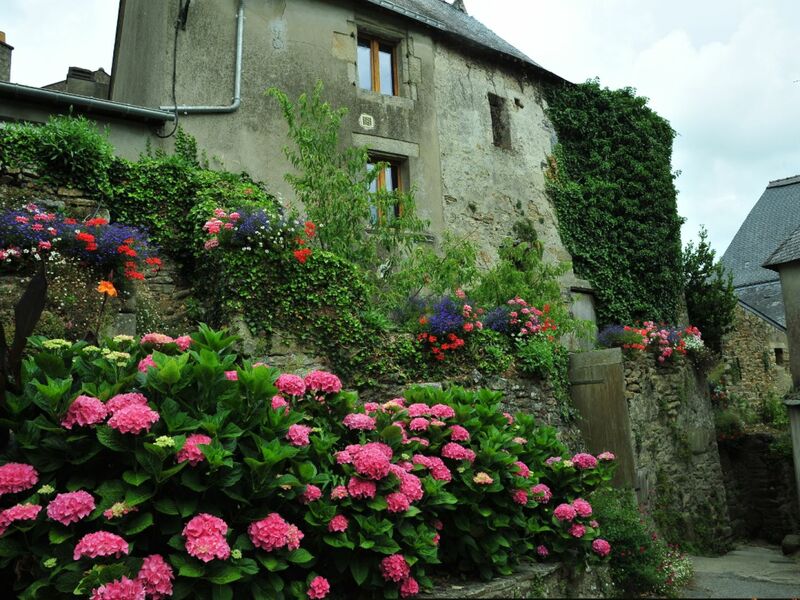 Our first port of call is the pretty village of Le Guerno, with its 16th century church built on the site of a Templar chapel. We then continue to Muzillac, where we can visit the Moulin de Pen Mur, an 18th century water mill where there is an exhibition of 18th C. paper production. After lunch, we get back on the bikes for a ride to an artisanal cider producer, to see how it is made – and what it tastes like! The final part of the day takes us to the port of Vannes, with its ramparts enclosing the well preserved old town and imposing cathedral. Our hotel is located at the southern tip of the city, right on the Golfe du Morbihan, and the restaurant has fantastic views to the water and the islands of the gulf. 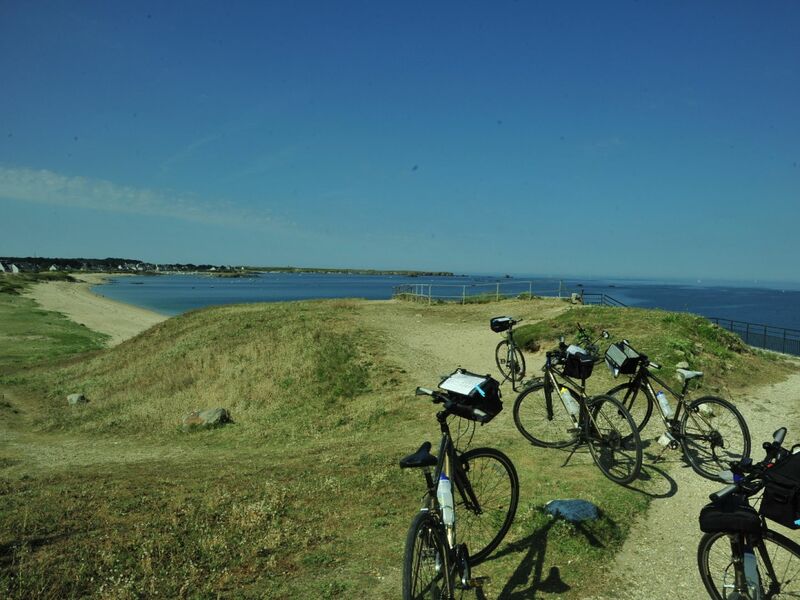 Following a vehicle-free track around the edge of the marshes, in the morning we cycle for a coffee stop at the Pointe d’Arradon, looking out into the gulf, with a picturesque harbour and a landing for much of the shellfish caught here. We then head for beautiful Auray, where the old town ramparts lead down to a picture-postcard setting on the river – a perfect spot for a crêpe (and a small glass of cider!). The afternoon is spent riding through tiny hamlets down to the coast and then through the picturesque fishing port of La Trinité-sur-Mer ; following the beach we come to our hotel in Carnac, in the heart of prehistoric Brittany. We are staying in Carnac tonight, so no packing! Off bright and early, our first ride is a short one to the Alignements de Menec. These astonishing standing stones date from 5000-3000BC , and stetch in total over 3 kilometres. We then continue for a circuit of the Presqu’isle de Quiberon. At the start of the peninsular is the forbidding fortress of Penthièvre, a pivotal location in the Chouannerie , the revolt of Royalists after the Revolution. The ride then takes in the breathtaking landscapes of the Côte Sauvage, where the Atlantic batters the rocks and coves into spectacular formations. 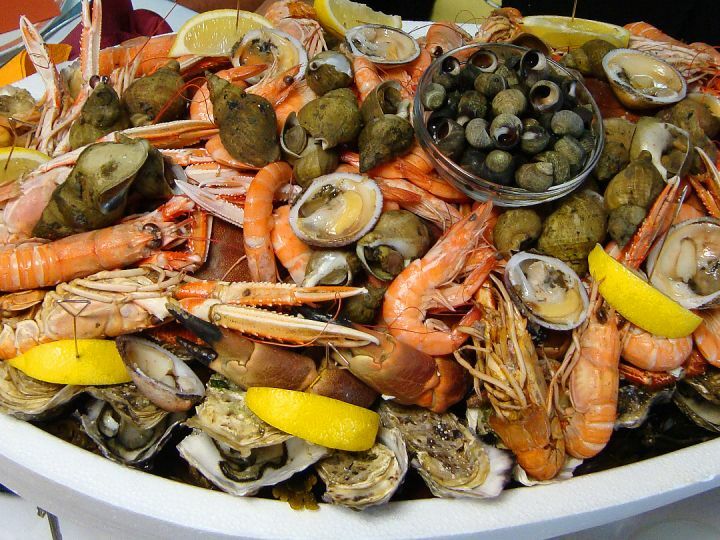 Continuing into Quiberon town, there is opportunity at lunch to sample the catches of the day. Returning to Carnac, there may be time before dinner to explore the prehistoric burial tumulus close to the hotel – or to take a dip in the pool or a relaxing sauna. Our last day in the saddle follows the coast closely, first going through the fishing port of Etel. Standing on the Ria d’Etel, it is a major production are for oysters, and we can visit and ostrea or oyster farm to learn about the raising of these prized delicacies. We continue for lunch into Port-Louis, where we can visit the 17th Century Citadelle. The Citadelle now houses a fascinating museum dedicated to the Compagnie des Indes, the French version of the East India Company, which was responsible for earning massive wealth for the French economy in the 17th and 18th centuries. We cross the broad estuary of the river Blavet by ferry then skirt the major seaport of Lorient to arrive at our lovely Château hotel. There will be plenty of time for a stroll in the magnificent grounds before a sumptuous final dinner to celebrate the week. Relax over a substantial breakfast buffet before onward transfer to Lorient TGV station for transfers back to Paris and other onward destinations. Our first hotel is a new concept in responsible luxury, an Eco-hotel. Using local, sustainable materials in its construction, maximising renewable energy in its architecture, and sourcing local organic products for its gourmet restaurant, the hotel has been awarded the Eco-Hotel label by Ecolabel Européen . This does not limit the luxury of the hotel however – owned by the Yves Rocher group and with an on-site spa and wellness centre, and a star chef in Gilles le Gallès, it is a wonderfully indulgent way to start the tour. A 19th century manor house, standing in a 10 hectare park, the 3* Domaine has an inviting swimming pool. If you would rather stroll the grounds, you will discover several rare species of trees, brought back from his travels by the first owner of the house, a British sea captain. Chef Joel Mauny uses his years of experience, including Michelin starred restaurants, to create exceptional dishes using local produce. Le Roof has an unsurpassable setting, on the tip of the Presqu’isle de Conleau on the Gulf of Morbihan. Water surrounds the hotel on three sides, and the hotel’s lawns run down to the shore. 25 metres away is a small sandy beach. The gulf’s waters are warm and safe for swimming. Seafood as you might expect is high on the menu, but the chef also does a mean rack of lamb! The Tumulus is ideally situated for the Carnac standing stones, but also has its own ‘private’ prehistoric attraction, standing right beside the stone-age burial mound which gives the hotel its name. Boasting a large swimming pool and a well equipped spa, the Tumulus has a fabulous restaurant which takes advantage of the hotel’s elevated position to offer a super panorama while dining. With a sauna, hammam, heated pool and tennis court the luxury matches the setting, and a final dinner at the hotel’s Michelin starred restaurant looking down to the river will leave an indelible memory of a wonderful week! Janine & Jason, Newtown, Victoria, Australia.